The HAPI Training Program fulfills our goal to provide engineering promotion and education to advance the continuing use of asphalt pavement and pavement treatments throughout the state. The goal of the program is to provide educational seminars and workshops that are regularly scheduled (i.e. once every year), allowing companies to plan and budget for their training needs. Watch for information about our workshops and seminars in our monthly newsletter, Facebook page, and website calendar. Click here for courses currently being offered. The job mix formula (JMF) is the recommended mixture, which includes aggregate gradation and asphalt binder type, to meet the project specifications. The JMF submittal is prepared by the paving contractor for any project that requires the construction of an asphalt pavement. The submittal is typically reviewed by the engineer of record. This two-hour workshop will discuss 1) the basics of asphalt pavement mixes, by discussion the Marshall method, which is the most widely used in Hawaii, 2) the production of asphalt pavements, and 3) how the JMF submittal relates to the project specification, using the Department of Transportation, 2005 Standard Specifications as an example. The presentation really broke down what to look for in a job mix formula submittal. It explained how to check if the mix meets specifications. Overall, a great informative workshop. What I remember most from the workshop are as follows: Gradation (JMF Aggregate Percentage Breakdown and Sieve Analysis calculation), Volumetric Relationships, and Nominal and Maximum Aggregate Sizes. **If you have 5 or more, HAPI offers to do this workshop at your office. 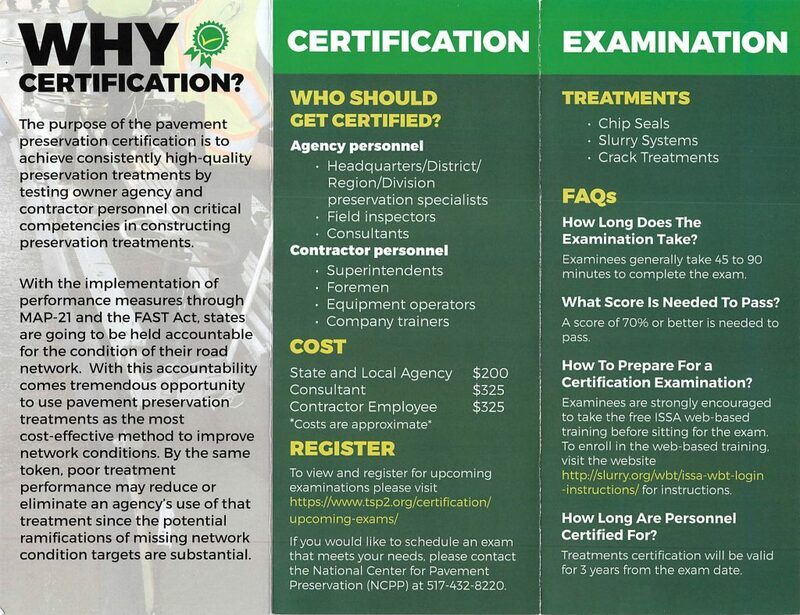 To schedule a workshop, please contact Jon M. Young at 847-4274 or by email at jon@hawaiiasphalt.org. PaveXpress is a scoping tool to help you create simplified pavement designs while taking into account key engineering inputs. The workshop will present the design of a new pavement design based on 93/98 AASHTO. Other PaveXpress modules include: Overlay Design, Mechanistic-Empirical Pavement Design and Evaluation, Intro to Mechanistic-Empirical Design w/PerRoad, PerRoad Design, Porous Pavement Design, and Initial Costing and LCCA Function. The PaveInstruct learning module is a FREE web-based pavement design education system with video instruction by leading industry experts. PaveInstruct accompanies PaveXpress. The education modules within PaveInstruct correlate with the design modules in PaveXpress and provide technically sound pavement design and instruction. – Troy Ogasawara – President, Geotech Solutions, Inc. In addition, the use of geosynthetics in recent Hawaii projects will be featured. The demonstration was the most memorable. Great method to show the product’s capabilities. Tensar was able to support their products’ benefits with test and field data to back it up. Demo outside with base course grid comparison impressive Prizes Good way to keep Audience Attentive. Instructors seem to be very knowledgeable w/ lots of real world experience. The hands on participation demonstrations and quizzes were unique and help the attendees understand the information provided. Geogrid (confinement, reinforcement) vs. Geotextile (separation); Functional vs. Structural Distress; Clear explanation of products uses and capabilities. Who Should Attend: Government agencies, contractors, engineers, and construction managers wanting to gain an understanding the use of geosynthetics in asphalt pavements. Cost: $0 includes breakfast. Parking is not included. Cost: Not set – In the range of $175-$200. Costs includes morning refreshments and lunch. Parking is not included. You have learned the basics in our Best Practices for Asphalt Pavement workshop (prerequisite for this workshop). This 3-hour workshop takes you to the next level. In this workshop, you are the inspector at paving project site. The attendees will then be split into small groups to discuss what they see in a short (1-2 minutes) video of various paving situations. The audience will gather and one of the groups will lead the discussion of what they saw. The group discussion will be followed by a presentation on the topic. During the registration of the workshop, attendees will have the opportunity to indicated what topics they would like to be cover (e.g. steep slopes). The top 4 to 6 topics will be covered during the workshop. Looping videos were great learning tools. It helped make us aware of job inspections and situations. You can talk more being in a small group. Good format, good interaction, good for learning. Good to learn from people with various backgrounds and levels of expertise. Cost: $100 Costs includes refreshments. Any fee for parking is not included. Industry visitors to Hawaii provide an opportunity for a “talk story” time. Attendees will be treated to learn from the experiences of our visitor in a small group (20 maximum) setting, which will facilitate and encourage discussion. The notice for each session will include the speaker’s bio, and suggested topics and questions for discussion. While there is no cost, there is a requirement in order to sign up. When registering for a “talk story” session, each attendee will be required to provide a question(s) for the speaker. We believe having questions in advance will provide our visitor with a good idea of the interest of the attendees, resulting in a more worthwhile and productive session. – I thought this round table event was very informative. – Bob knows his stuff. He is the type of resource person I can spend hours talking with. Who Should Attend: Government agencies, contractors, and engineers. AASHTO TSP•2 Preservation Treatment Certification exams for crack treatments, chip seals, and slurry seals are offered in Hawaii. In the future, the Department of Facility Maintenance, for the City and County of Honolulu, may require their consultants to be certified. Who Should Attend: Government agencies, contractors, and engineers involved with crack treatments, chip seal, and/or slurry seal. – Thank you for the opportunity to learn and prepare for the exams! – The presentations were very organized and the teachers are knowledgeable. – Having someone giving advice from a previous course/test was very helpful in preparing for the upcoming tests. – HAPI is very important to ensure that knowledge is passed down and standards are maintained in the field. Cost: $55 for HAPI members; $80 for others Costs includes morning refreshments and lunch. Parking is not included.